Over the years we have chastised Honda (along with the rest of the motorcycle press) for selling motorcycles they classified as scramblers, but in reality were scramblers in name only. They were about as much at home off the road as a fish out of water. They were heavy and didnt handle too well and for the most part didnt have enough power, but they did sound neat and they sure looked good. Those last two items are what sold the product. Besides, the American rider didnt care if they went off the road or not. The majority of street scramblers that are sold never leave the pavement. Hondas are no exception. When news filtered through that Honda was about to pop with a new 100 trail bike, we just kind of sat around and said, Ho hum, here comes another one. But we were wrong. Much to our amazement and surprise, Honda, it would seem, has finally gotten on the ball and given the off-road enthusiast just what hes been asking for for many years. Right at the outset let us say this: In virtually every aspect, the motorcycle is superb. It is by far the finest off-road machine Honda has ever come up with. We had one neophyte rider (the publishers wife) doing amazingly well in a very short time. We made a concerted effort this time to get a group of people who are not expert riders to ride the motorcycle, so we would have a better chance to evaluate this machine in the hands of the less experienced. The results were quite enlightening. 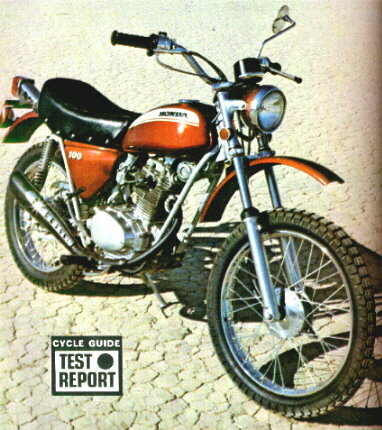 Because of the abundance of low end torque, plus the handling qualities, the learning period was exceedingly short, regardless of how much experience the rider had before. It is an ideal learners or duffers machine. Another thing we found was that it was difficult to make a serious mistake. The machine is extremely tractable at all speeds, with one exception: The only fly in the ointment is the choice of tires. They are too small to have the wrong pattern. They just dont do the job in the dirt. Anyone contemplating the purchase of this motorcycle had also better plan on replacing the rubber immediately. For cow trailing, or hard dirt, or on a fire road they are fine, but once you get off in the loose stuff, the tire performance is poor. Surprising as it may sound, this was the only real criticism we could find with the motorcycle. The engine is an all-new design. The clutch and gear box are the derivatives of things that have come before, but one ride will indicate that this all-new engine, gear box and clutch package has been in development for a long time. Shifting gears takes about as much effort as pushing a hot knife through butter. Also, one of the bugaboos of the old Honda 90 (the sticky clutch) has vanished. The new clutch is so good that regardless of the temperature, hot or cold, the machine can be put into gear, the clutch pulled in and the bike will roll freely. Just try that on one of the old 90s and see what happens. Another thing is that you dont have to find neutral if you should stall the engine. Just pull the clutch in, prod the kick starter, and youre off to the races. The bike can be started in any gear. Clutch action is velvety and very positive. For a 100 it puts out a surprising amount of power. The factory rates the engine at 11.5 hp at - get this - 11,000 rpm. Thats one lot of revs for a mild mannered trail bike. Since there was no tachometer mounted, we had no way of confirming whether the engine would turn 11 grand, but it does turn a bunch. More, in fact, that youll probably ever use. Since it is a four-stroke, however, it is nice to know it will turn its kind of rpm without anything getting tangled up inside. We found that when the engine was cold, it generally took five or six kicks before it would respond. Once warm, however, one kick was all that was needed. If the rider should fall, and we did it twice, you find very quickly that the first thing you want to do is turn the gas off and get the machine as upright as possible in as short period of time as you can. If you dont, the engine will flood. Ours did, the first time quite badly, and it took a bit of doing to get the fire restarted. Another thing we liked about the power package is that its very quiet. One thing that did surprise us was that Honda has used a low exhaust system rather than an upswept one. Our guess is that they found there is more power to be gained utilising this type of exhaust system rather than the high pipe. Even though the exhaust pip passes underneath the engine, it is tucked up well enough out of the way so as to prevent any damage even when going over rocky terrain. The suspension system is pretty good. For high speed running you might want something a little more sophisticated, but for the thousands of people who will be buying this machine mainly for weekend transportation off the pavement, Hondas choice of components was a good one. We found that by hitting hard bumps at about 35 or 40 miles an hour, we could not get more than 4.5 to 4.75 inches of fork travel. This, however, is not too bad, because it is adequate for what the bike is designed to do. The rear shocks worked quite well too. They not only served to smooth out the ride but they kept the rear wheel on the ground the major portion of the time, which is something that not too many people give much thought to. A heavier rider might choose to replace the springs with heavier ones, but anybody up to 150 to 160 lbs. should have no trouble with the rear dampers. Like the 350 motorsport, the 100 model employs a wide, plush and very comfortable saddle. It's long enough to allow the rider to slide back over the rear wheel for more traction and at the same time get more weight off the front end when going through deep sand or loose terrain. However, the back of the seat tilts up rather steeply and it's a bit uncomfortable sliding back and forth. Also, it's too short for riding double. One thing we would like to see changed is the dimension of the wheelbase. The stock 100 measures 49.4" and it is our opinion that it is too short. For just plunking around in the woods or down a fire road somewhere, this might be fine, but once the machine gets over 35 miles an hour (and this is really easy to do), you wish you had a couple more inches to play with. The bike gets a bit twitchy and some of this twitchiness can be attributed to the choice of tire, but a good portion of it is the short wheelbase. By stretching the wheelbase to 52 inches (minimum), the ride and stability would be much improved. One thing we were definitely disenchanted with was the artistry displayed by the welder fabricating the chassis. It's very poor - big globs of metal are used to hold the various parts together, and we are very surprised to see this coming from Honda, who in the past has displayed more than casual attention to producing a quality looking product. The rest of the bike, however, is well done. The machine sits well. When you climb on board you feel right at home. There is no need to become adjusted to the handlebars, foot pegs or the seat. Honda has achieved a delightful balance with the location of these three items. Extremely tall or short people may take some exception to this, but people from 5'4" to 6' should have no problem whatsoever. Slightly wider handlebars would be nice, but they are not really essential. Under extremely rough conditions, we found that the Honda had absolutely no tendency to overheat. It always ran about the same temperature. Also, no matter how hard we rode the bike, it always displayed an even temperament, and although the engine only displaces 99 cc's it is perfectly tractable in any situation. Some people might take exception to the word "any," but nevertheless this is the case. Nothing short of a vertical wall will stop the bike's forward process, and even then we would imagine that changing gearing would solve this problem. O.K., so the bike goes pretty well off road, but what about on the street? It performs equally as well on pavement as it does in the dirt. The wide power range and ample torque output of the engine make it a delight in traffic. While the tires were not adequate in the dirt, they do work just fine on the street. Also, we could not find any fault with the brakes, on or off the road. Both brakes are of a simple leading shoe design, but they do work well, and there isn't much more you can ask of them. The paintwork was pretty good, although the chrome looked very seedy. While there are some things on the motorcycle we could classify as stretchy, our opinion is that Honda has spent their time and money on the things that really count. The 100 is strong and serviceable in the strictest sense of the word, and our guess is that nothing short of pushing it off a cliff is likely to damage it. Wit a couple of small changes (slightly longer wheelbase and better tires), the new Honda 100 would be our choice for about the best 100 cc trail bike you could buy, regardless of price. It's impossible to fault the performance of the Honda 100. It handles well, it goes reasonably fast, looks pretty sharp, is priced competitively right along with the other 100's, has a torque range that won't quit, and although it's not vitally important, the engine is rather miserly where gasoline consumption is concerned. Under normal conditions we found that the 2 gallon fuel tank will get you about 150 miles. This 75 mile per gallon figure was attained over just about every possible condition that we could come up with, both on and off road. The only problem we had in all the time we rode the bike was the speedometer quit working for a while and just as mysteriously started working again. We never did find out what had happened. The 100 is a fun bike to ride. It's forgiving, almost to a fault (as compared to other 100's) and the machine is a lot of bike for the money. All things considered, the bike is great value, and although there are a few shortcomings, it does what it was designed to do in an unobtrusive and fun-giving manner.